As the graceful Geisha moves softly through the palace gardens, a rare golden butterfly catches her eye. While in quiet contemplation, she admires the wonders of nature and beauty surrounding her. 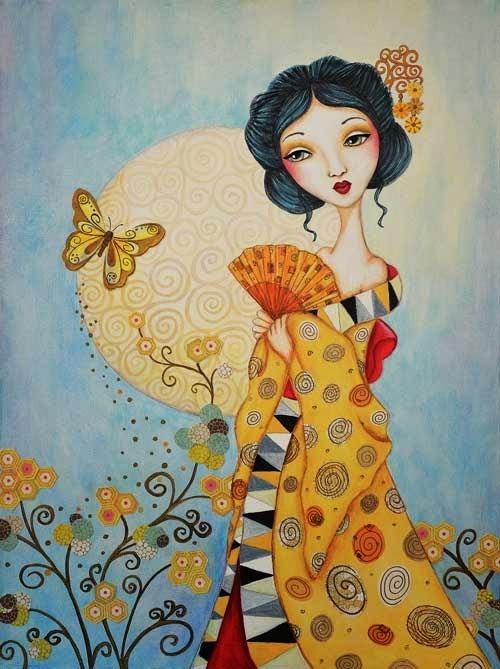 "Geisha with Golden Butterfly" still holds a special place in my heart as she is my first mixed media on canvas, painted about three years ago. Acrylics, caran d'ache watersoluble crayons and scrapbook papers were used. It was a course with the gorgeous Tamara Laporte, with Klimt as the inspiration for that week. Also I finally opened a Shop!! I have a few of my favourites to start with including "Geisha with Golden Butterfly" I will be adding more in the following days and weeks. At the moment the prints are A4 size, I hope to offer a smaller A5 size soon. You can check them out with this Link or on the sidebar under Shop. For this piece, I was inspired by the theatre. 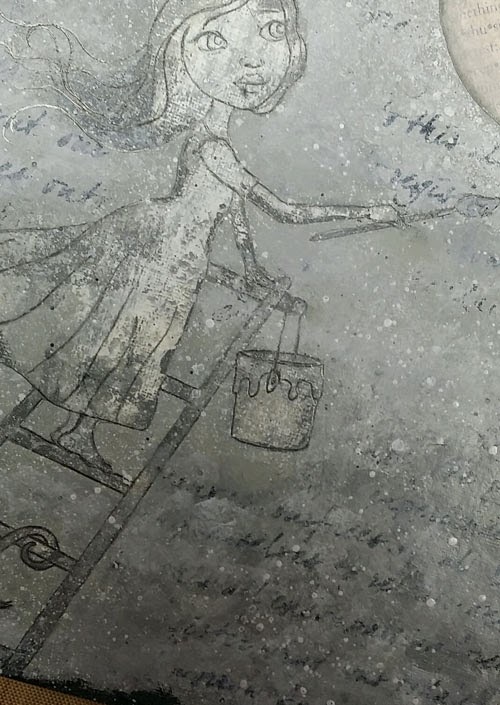 The little master painter seeing to all the details and translating the director's vision into this whimsy dream set. Of course she needs help bringing this together with her assistant who diligently works away under her supervision. They have to work quickly if the set is going to be ready in time for the opening night! After all, those extra details bring the story to life creating mood and atmosphere. 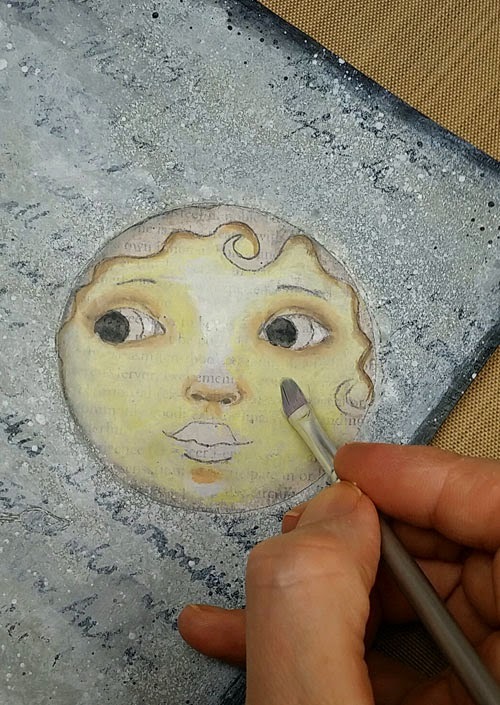 Layers of black, white and grey acrylic paint were applied onto the acrylic texture paper with a palette knife. Even though I love this look, I felt it was a bit overpowering for what I had in mind. I softened the background and then added textural elements in the form of the stencilled writing, paint spraying and splattering. 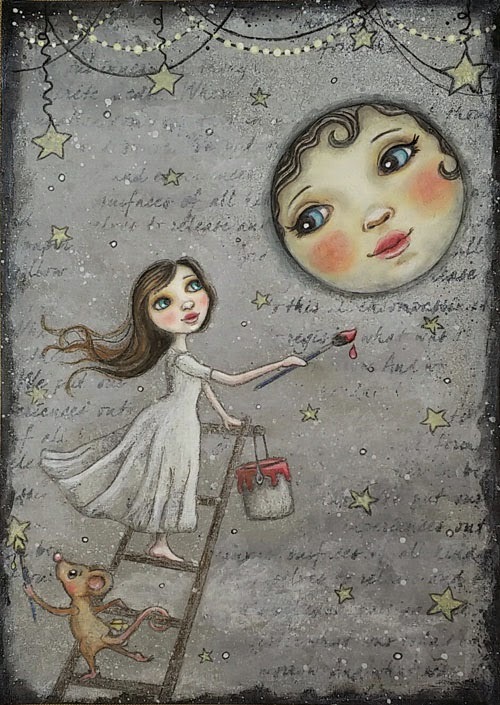 Scrapbook paper was glued down for the moon. A couple of kiss curls appeared giving her a 1920's feel! I might have overworked her, as I would have liked the text to be more pronounced. 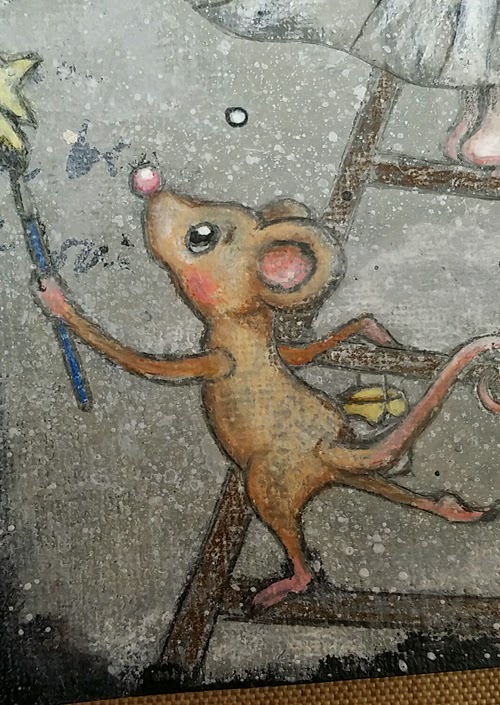 This cute mouse assistant took on a little dramatic pose as he paints the star. 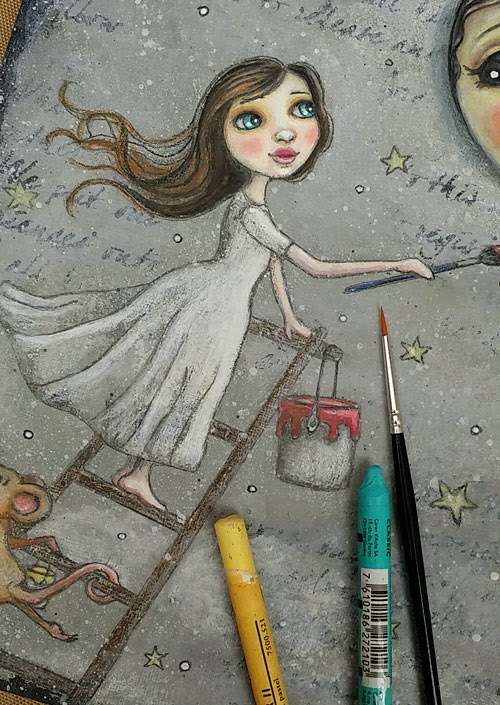 A combination of art materials were used; colour and watercolour pencils to pick up the grain of the paper along with carn d'ache watersoluble crayons and acrylic paint for the most part. A fine pointed paintbrush is ideal when working on details. 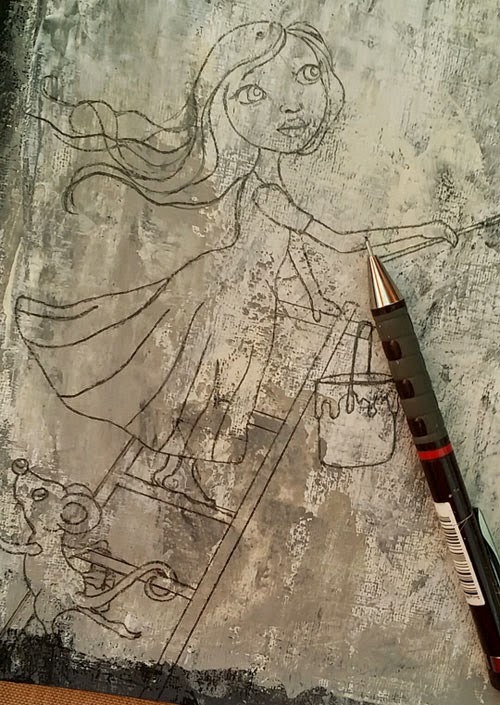 I am happy to say the little painter and her trusty assistant finished everything on time and are now working on an elaborate fairytale scene. Comments are welcomed and encouraged. Have a lovely weekend.